About ArtMobile — Attitudinal Healing Connection, Inc. 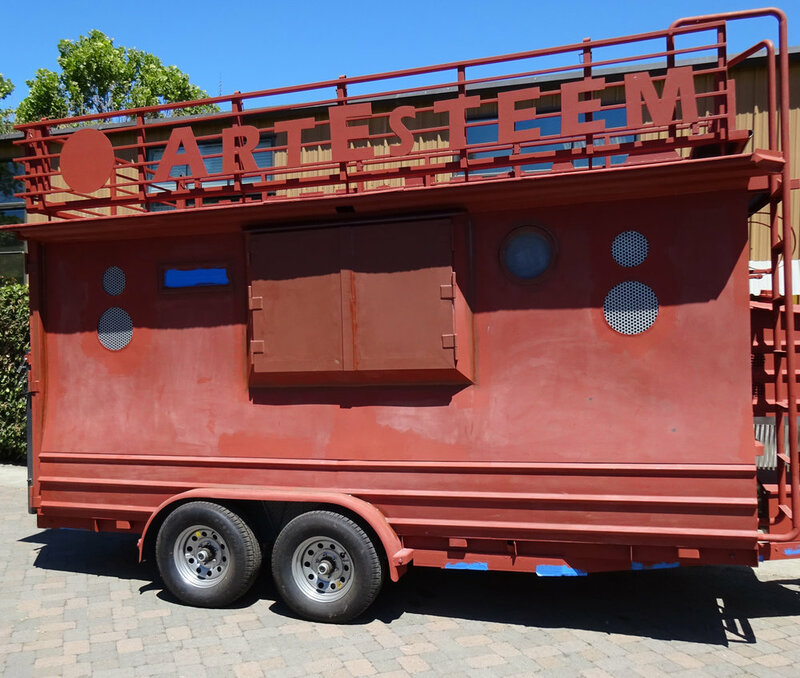 The ArtEsteem ArtMobile is built on a 16' trailer, topped with custom-built steel structure with wood interior. It has plenty of storage for art materials large and small. It has a built-in water tank, sink, bbq, roof deck and ladder, wired lighting powered by generator and a sound system for outdoor events. Four rolling tables house additional material storage and create mobile outdoor worksurfaces. A service window allows for flexible use of the ArtMobile for art sales or rental for other events. The process of creating the ArtEsteem ArtMobile was an opportunity for West Oakland youth to learn about architecture, construction and how a mural is designed. Students helped define what the ArtEsteem ArtMobile should do, participated in the design and met build team members throughout the process. College students form California College of the Arts - Diversity Studies studio course, Art in the Public Interest, contributed to research, design, and youth teaching.